On December 22, the consumer demo of the highly anticipated title NieR: Automata™ will be available on the PlayStation™Network. 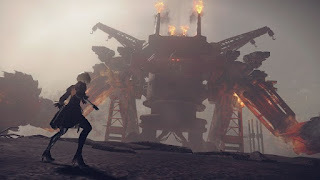 With an abandoned factory as the backdrop, the demo follows android 2B’s mission to destroy a massive enemy weapon that lies within. The latest PlayStation Experience trailer is available at: https://youtu.be/afh9qwWiNnA. NieR: Automata will be available for the PlayStation®4 computer entertainment system on March 7, 2017in North America for $59.99 and Steam® in 2017. The “Black Box Edition” is available for pre-order exclusively through the Square Enix® Online Store for $189.99. The Day One Edition is available for pre-order at all participating retailers.